All politicians say the same things don't they? "I've always put the people first," or "I'll look out for your interests and fight the special interests." You can go back decades and look at almost any political race and the conversation is the same. The truth is that politicians are simply out for themselves. It's their egos that drive them. They want a higher seat than they currently have, and will say and do just about anything to get it. The people keep falling for the same boring lines and political consultants keep manipulating the public. Take Governor Charlie Crist of Florida who just announced he was now running as an independent because he is way behind in the polls as a republican. Don't the people see this for what it is? Do they really believe that he cares so much about Florida that he realizes he's the only person who can possibly represent them the way they deserve, so he needs to switch parties to accomplish what's best for Floridians? Give me a break. Mr. Crist has no way to win as a republican so instead of accepting the fact that the people prefer someone else to represent them, he thinks only of himself and switches parties. Doesn't he care that he might split the republican vote and elect a democrat instead? Probably not. This kind of party switching isn't new. Joe Lieberman did it, and so did Arlen Spector. The list of people who look out only for themselves while draping themselves in the banner of "public service" is a mile long. We need to stop electing people based on name recognition and celebrity in this country, and start electing people with real world experience. We recently elected a President based on celebrity and look where it got us. We're repeating the same mistakes of 30 years ago and we're going to end up in the same place. Can you say stagflation? 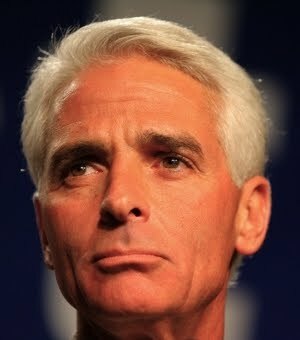 Charlie Crist is full of it, but the sad thing is that he's not alone. In my book all politicians care only about themselves. Every single one of them should be replaced, term limits imposed, and their salaries cut by 70%. Maybe then, we'll get the kind of selfless representation we deserve.